Imagine a long road ahead. Imagine the wind blowing in your face and ribbing your shirt. Imagine the sun rising as a red glow at the horizon. Imagine endless plains of nothingness alternated by huts and electricity poles breaking the pattern. Imagine kids laughing and waving you bye. Now imagine me on a bike and my sister next to it and you got a good picture of what we’ll be doing the next month. Now my life in Rwanda entered its closing chapter, it feels like time for a new challenge. Together with my sister I will be crossing the East Africa on bike: 4500Km ahead, 4 borders to cross and the road as a our guide. We will both be driving a simple Indian bike. Now let me give you a little background on these Idian bikes: Bustling the streets of Kigali are flashy Indian sport bikes; simple, light engines and available at rock-bottom prices. They are without doubt the most bang for your Rwandan buck. These bikes are the NY’s yellow cabs of Kigali and hard to miss. Anyone with 10 dollars on him can hire one for a day and drive around passengers (earning about 20 dollars and possibly a broken bone). To avoid sitting on the back of one of these daredevils I decided to buy one myself when I came here: a Bajaj 125 cc. Driving the bike for almost 9 months now I have grown more confident, on the last trip with Bas we decided to test its limits and drive it to the West of the country. All went fine and this time I want to push it a little further; driving through the whole of East Africa. Some think this trip is a great idea, others think I am mad; the vast majority of the Rwandans tilt towards the latter. Transport is seen as a danger way to get from A to B, using it for pleasure does not configure in the minds of people here. When skyping with my sister Tirsa, I told her about my plans and spontaneously she decided to join. Within a week she booked a ticket and as the bird sing their songs at the start of April we will both hit the road. As there is no space to carry spares we will have to rely on the ingenuity of the local population along the road (which can hardly be overestimated). 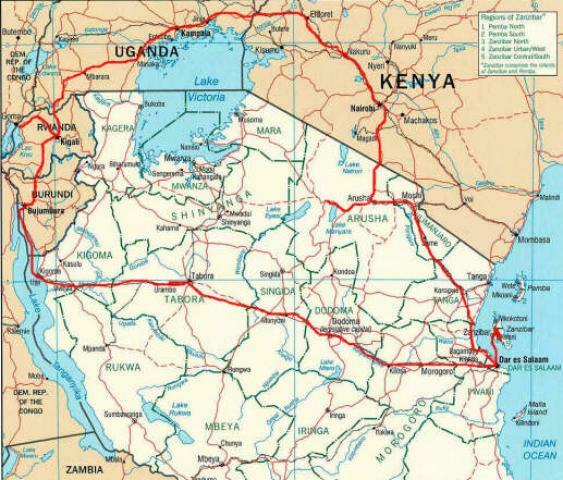 I guess it will not be the question if, but when we break down… The intended route is driving through Uganda, Kenya to the coast, Zanzibar and back through Tanzania but God knows what the actual route will be, how many monekys and elephants on the way and where the road will exactly takes us. All I know is that I am looking forward to this trip. This trip marks the end of my stay in Rwanda. I have had the privilege to work in a fast developing country and can look back happily on the job I was able to do here, helping farmer to find a profitable market for their harvest. To give you some insight in the job I have been doing here is a link on a brief case study I wrote and here a link to a short video on Odette, one of the farmers I work with. In preparation I have been studying Swahili (the main language in East-Africa) for some months now and hope to engage in a conversation with some Ugandans, Kenyans and Tanzanians along the way. I got a new job! Starting 21st of May I will be working in Ethiopia for SNV, a Dutch NGO working with sesame, maize and peas farmers. I will be stationed in Bahir Dar, a cute old touristic town as the shores of Lake Tana. We hit the road this Sunday and will be back on the 28th. I will be in the Netherlands from 2-19 May. Wat gaaf dat je hulp hebt kunnen bieden in Rwanda. Veel plezier met je zusje! Ook wensen we je een goed verblijf in Nederland.